I thought I missed the PTI Blog Hop!!! You can visit the May Blog Hop List in the PTI Forum and see all the other bloggers who are participating by clicking here. 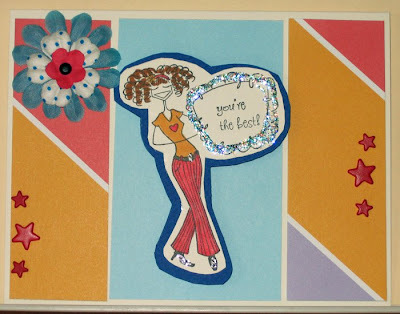 This is the card I made for this month's Blog Hop Challenge. 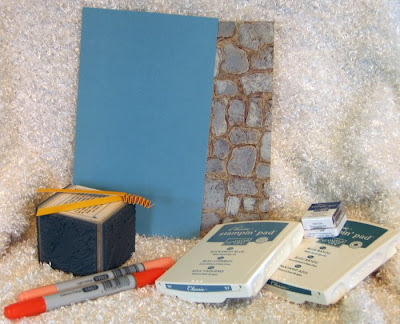 Here's the challenge, direct from the Papertrey Ink site, "Your challenge this month is to utilize score lines in a creative way as a decorative accent to any type of project. I look forward to seeing all of your results!!!" I started with a pale lilac cardstock, measuring 5-1/2" x 5-1/2". I added a 5" x 5" piece of Sweet Blush. This is the bit I used my Scor-Pal for the scoring lines. I tried to create a diagonal pattern and on two of the squares, I attached some of the printed paper that was available for download from PTI. 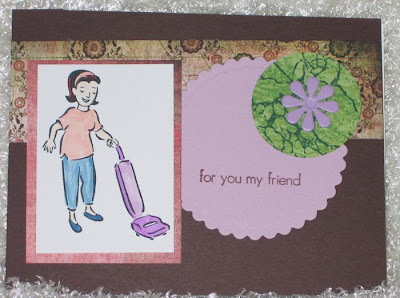 I stamped some flowers from the Text Boxed set using Berry Sorbet ink. The baby stamps I used were from Studio G clear stamps as I didn't have time to get the newest release from PTI, but I will! I added some chipboard photo corners which I covered with more of the downloaded paper from PTI and inked the edges (a little over-zealously, methinks!) and adhered them to opposite corners. Then, to finish it off I put on some buttons from Buttons Galore. Okay, this is my first time to participate inthe PTI Blog Hop and I'm so happy to be a part of it. I should be sorting out closets, but I'm playing instead. Here are the cards I've made in the last couple of days. This is to invite our relatives to our new apartment to remove the wallpaper borders and do a general cleaning before our furniture arrives. Hope they come! For no particular reason, just like the set! Birthday card for special friend! Today's post belongs in the category "Other Stuff". 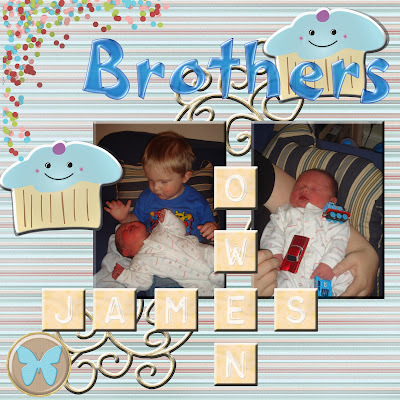 I've been messing around with digital scrapbooking and here is one of my first attempts. I've been to many, many sites for digiscrapping and today's layout was put together using kits and/or embellishments from Atomic Cupcake and Two Peas in a Bucket. The paper is called Winter Dreams by Atomic Cupcake and it was a freebie. The word "Brothers" was created using a Gel Action, also free from Atomic Cupcake. 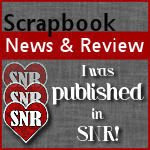 I will be visiting their site more and more as they have great kits, embellishments and actions. For any digiscrappers, please go take a look. Two Peas in a Bucket is also a favourite place of mine to find quality kits and the like. The cupcakes used here are from the kit known as KTeague Cuppycakes and I purchased this kit several months ago. I finally got around to sitting at the computer and playing around with my stuff. One of the things I really like about digiscrapping is once you have the embellishments, you never run out (unless your computer crashes). The supply is endless for a one time purchase! It doesn't get better than that. Well, I'm off to play some more and do a layout about COUSINS that will focus on all of my grandchildren. 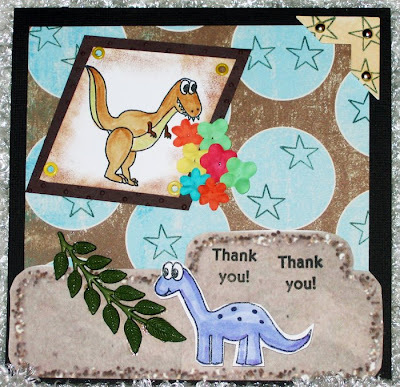 Here's another card I made using the Adorable Dinos stamps from JessicaLynn Originals. The dinos work really well for shadow box cards. I added a little twist, literally, to the card. Instead of mounting the dino with pop-dots, I used the 'folding straw' technique. Maybe some of my readers will recall the days spent sitting in the local, after-school, hot-spot and drinking Cokes with the old-fashioned paper straws. After the drink was done you'd take the straws, plural because they always put two into the glass, and flatten them and then layer one over the other and start folding. It was just something to do with your hands while you and your girlfriends were drooling over the latest cutie pie in the school. Anybody remember doing this mindless activity? Anyway, I thought that it would make a great way to adhere an image that required movement and, I think it worked pretty well. Here's a close up picture looking down and behind Dino. Instead of writing a list of the supplies used, I decided to photograph what I used to make this card. 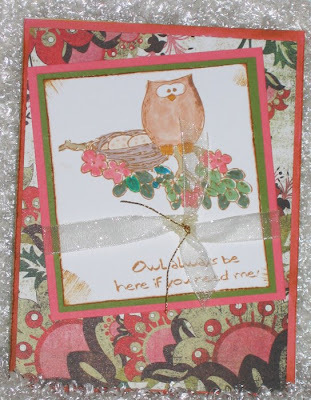 The stone-looking patterned paper is by ProvoCraft and I picked it up at Michaels last week. Works perfectly for dinosaurs! I recently started visiting the blog of Michelle Zindorf, Freedom in Creating. Everything she does inspires me and, in order for me to learn, I have to copy. Her card, "MFT meets City Nights", inspired the card below. I cased everything except the colours and the stamp set I used. I hope Michelle doesn't mind, but, now that I've done it once, perhaps I'll be able to come up with a layout of my own. I printed out her directions (11 pages) and followed it step by step, even then making a couple of mistakes. Oh, excuse me, a couple of changes! LOL! I even went out and found the Rubber Stampede Mirror Image stamp so I could make mirror-image cards. Who knows what I'll come up with next. DH had a suggestion and I may pick his brain more to see if I can figure out what he wants me to create. If you haven't read the post below this one, please do. My DH 'hijacked' my blog and posted a 'surprise' entry. He still has my password from when I was in the hospital and he was doing the updates for me. I don't think I'll change it because his entries are always so enjoyable. Well, my DW did two things she may regret: putting the April/May issue of PaperCrafts into the bathroom and, not changing her password after getting back from the hospital with her knee replacements. The PaperCrafts magazine is mostly projects and stuff but the products should be viewed by all DH's as required reading. These are the items you will need to find something to do with when your own DW replaces them with the newer-better-cooler version. First off, on page 8 is an advertisement for a craft organizer. I dare any DH to look around the house and not find at least one “absolutely necessary” organizer for craft stuff which is no longer organizing anything. You might as well start thinking of what to do with it now. If you paint it red and put some personalized graphic on it, it serves as a great tool caddy. This is considerably cheaper than Snap-On but probably not nearly as sturdy. Even so, considering you'll get this “for free” eventually, no point spending the big bucks now as this will be yours before you know it. There is another advertisement which while not notable for future use, is notable as a warning to all DHs: Page 29 has an “Archiver’s” advertisement in which you see a view of the whole store from just behind a woman’s head; her hands up in amazement. The tag line is “Like a kid in a Candy store”. Take this as warning men and remind your DW that candy is bad for you. I suggest taking her to Home Hardware prior to any trip to a place like this. Go to the lightbulb section and explain to her the variations in wattage and lumens between each type. One hour here for every five minutes in a craft store should equalize the situation sufficiently. Be sure to take her to the hardware store before going to the craft store though as any effect this may have is short-lived. Page 50 has an article on how to make jewelry. While you probably can’t stop her from making these things, try to get her to address them to a specific name, like her friend “Julia”. Then name your tractor “Julia” and you can pimp it out when she doesn’t give it to her Julia because it’s so lame. Steer her to colours that match too. That’s actually not difficult if you remember the “Rule of Women’s Colours”; one name is lame; two is new but three is fashion. She won’t bite for “beige” but might for “Sahara Sand” and will think you’re top-notch if you suggest “Louisiana Butterscotch Tapioca”. Trust me, it’ll be the “beige” you wanted anyway. On page 61 is an advertisement for “Gorilla Super Glue”. Because crafters are notoriously misled to believe everyday items are not sufficient for crafting, manufacturers have learned to market to them specifically. Well, you too can play this game. Get out your “Marks-A-Lot” marker and add this to the regular bottle of Elmer’s you have downstairs: “Now Specially Formulated for Crafters” and watch the action. You’ll have to remember it will be stored in her own private stuff but if you need to fix a broken chair or something, you can always do it when she’s distracted by some Home and Garden special on TV. Page 74 starts an article on dressing up chipboard. What’s with that? No more need be said! Page 103 is the best. The tools on this page look like any you’d buy for yourself, except the packaging, which tends to look too feminine for proper tools. However, think of the shoes you have in the garage; yes, the ones with several eyelets missing and the broken laces. You can make those shoes almost new again with tools like this. Using the coloured eyelets she has will probably be considered cool by your kids but don’t wear them to your lodge; too dicey for that. Try to see if she has any black ones as they’re less likely used by her and therefore more likely not to be missed in the first place. Lastly, on the back cover is the ultimate budget-breaker: the “Cricut Expression”. I’m told this is already at its third or fourth generation and so some of you may already have one of these in the basement. Think of cool ways to “Pimp Your Tractor”. Personalized bumper stickers look like they’d be a breeze with a tool like this. And it makes stencils as well as letters so you can finally find a use for that paint sprayer your brother gave you for Christmas in 1989. Well, they say death and taxes are the only inevitable things but for DHs of crafters, hand-me-downs are likewise inevitable. If you can stop your DW from buying these in the first place, then the Nobel committee wants to talk to you. Otherwise, we all might as well get accustomed to thinking of things to do with this stuff. Aren't these dinosaurs just adorable? I received them yesterday and just couldn't wait to ink them up. This set is called "Adorable Dinos and has both stamps in the set. I used them both on one card to get started. 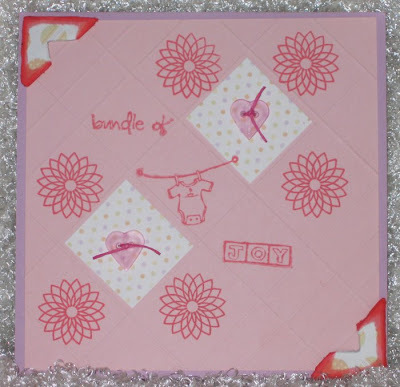 You can see the set at JessicaLynn Original Stamps. Go look, you'll be glad you did. The card is 6" x 6" and the base is Bazill textured cardstock. I layerd that with some My Mind's Eye designer paper. It's actually from their Christmas pack, but works okay with this card. I stamped some stars on the circles just for added interest. 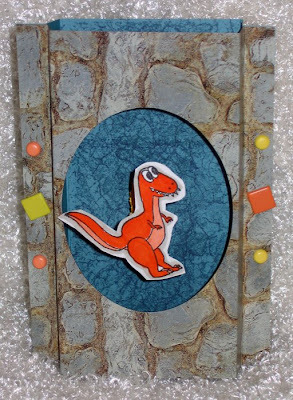 I cut out the purple-coloured dino and adhered him with glue dots for dimension. In front of him, I placed some leaves from Buttons Galore which is a great place for embellishments of all sorts for cardmaking. They have special collections with flat backs that are perfect for cards. 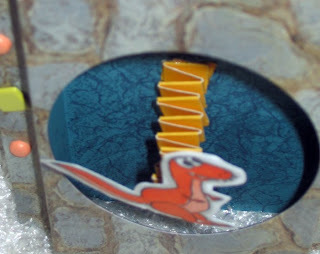 Then I cut the other dino on an angle and mounted it to a piece of Chocolate Chip c/s which had been put through my Cuttlebug using the Swiss Dots embossing folder. 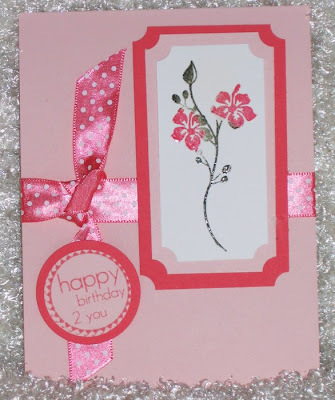 I added a few small prima flowers and the Thank You sentiment, also from JessicaLynn. I think they are saying thank you to God for supplying such good things to eat! That's my story and I'm sticking to it. I'm sure with three grandsons that this set will see lots and lots of ink in the future. It seems that my grandson loves stickers, so I decided to make him a book for him to put his stickers into. I had never used my BIA and thought this would be a terrific time to try it out. Now, if my son, who also has an almost 2 year old son, reads this, you can expect something similar for Jack on his birthday. I just need more covers before I can get it made. I don't know about you other grandmas out there, but I absolutely MUST keep things even. It's an old holdover from watching my own Mother make sure that all her 10 grandchildren were treated equally. I think it's a good thing, so I'll be doing the same with my grandchildren. 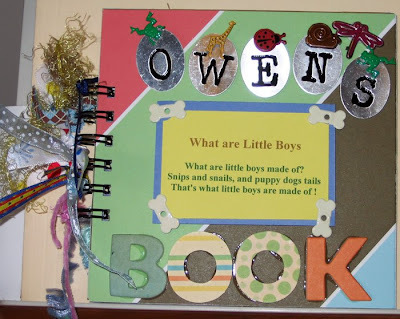 I sure hope Owen enjoys it and that his Mommy will put it away as a keepsake when it's full of stickers. I'm going to stamp some images on the pages for him just to make it more interesting. I decided to participate in the Bella Sketch Challenge on SCS yesterday and this is the card I made. I love the sketch Jamie presented for the challenge and I'm sure I'll use this layout many, many times. I thought the DP was great for this card and I only just picked it up at Michaels the day before. Usually I horde my DP, but I actually got to use it this time. Okay, everybody, hope you all have a great day. I played with my stamps, ink and paper! Because we'll be downsizing so drastically when we move, it's absolutely necessary for us to have a major clear out. I went downstairs with all good intentions, really, I did, but the 'pull' of my crafting supplies was too much for me. I just plunked myself down at the table and made some cards. I mean, seriously, what would you have done if faced with working or playing? For me, it was a no brainer! Here's what happened instead. 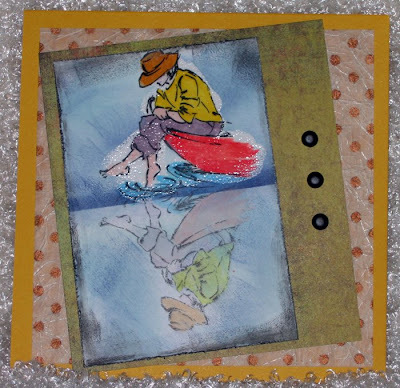 I used the sketch by Lauren Meader at My Time, My Creations, My Stampendence. She has a really terrific post today, reflecting on her first 30 years. Happy Birthday, Lauren. The image which you may recognize is Rachel, of the Kindred Spirits collection by Gina K. Designs. I hope that when my grandchildren start sending me their precious artwork that I'll be putting it up on the fridge, too! The sentiment is from the Women Of Life set by Papertrey Ink. 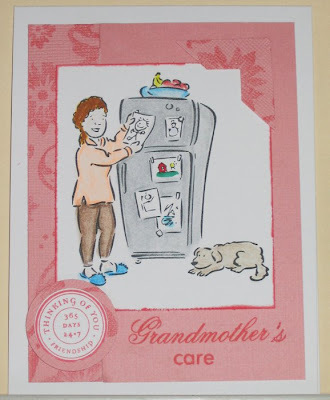 I took the word 'Grandmother' and used my red, Spica pen to carefully add the 's . Now that I'm writing this, I just realized that the apostrophe was unnecessary. Dang it, why didn't I pick that up earlier, like before I made the card. I did have a 98% average in English!! I guess it was too long ago for me to remember. I hope the recipient doesn't mind. I'm sending it to a very special friend. 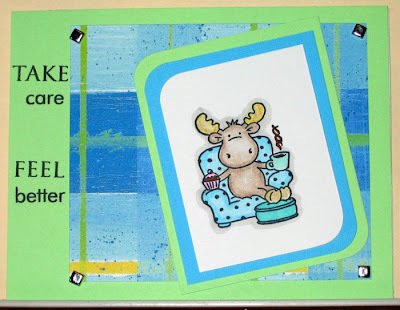 The Riley moose card is for my son, Andrew. He's been coughing and coughing for the past several weeks and on Friday, he coughed so hard he fell on the floor at work. His fiance took him off to the ER and, after several hours of waiting, he was told that he had a virus, no medications would be useful and to just take it easy for a few days. I hope he heeded their advice and I just wanted to remind him to take slow down for a little bit. They just moved into their new house last Sunday, so I'm sure there's plenty that needs doing at home, but, Andrew, it will still be there when you feel better. Remember, Mom knows best! This little fellow is the newest member of our family and my third grandson. 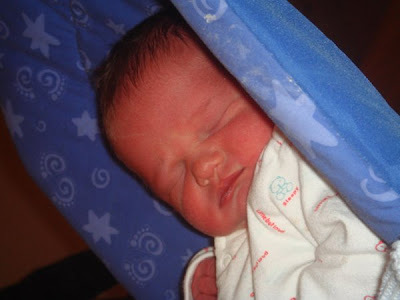 He arrived on May 1st, 2008 at 10:47 p.m. in London, England, weighing-in at 9 lbs. 5 oz. Isn't he beautiful? He's so gorgeous, he deserves a post all to himself.